6-Pack of Small 12.7oz Vinaigrette (Buy 5, Get 1 Free) PLUS a 6-Pack of Savory All-Purpose Seasonings (Buy 5, Get 1 Free) And, an Extra Bonus Seasoning! Great for Gift giving! Get a 6-Pack of Small (12.7oz Vinaigrette) at the Buy 5, Get 1 Free Price PLUS a 6-Pack of Savory All-Purpose Seasonings at the Buy 5, Get 1 Free price. And, an Extra Bonus Seasoning! 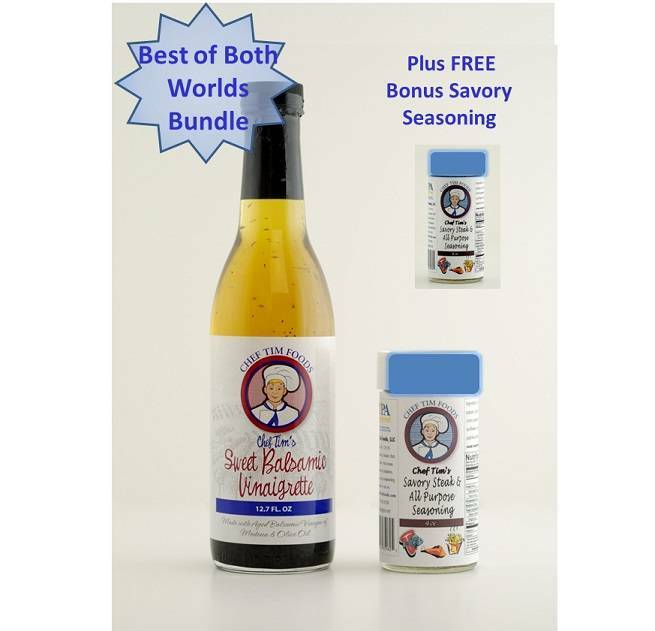 Great pairing for a Gift and a Great way to share your love for our Vinaigrette & Seasonings! Chef Tim's Savory All Purpose Seasoning - A delightful blend of spices for beef, pork, veal & lamb, including roasts, steaks, chops, loins, fillets, and burgers. Also great on roasted potatoes, fries, pizza, vegetables and soups. Good on "Anything that walked, swam flew or grew."